The trees in the background are in the shape of wine bottles and the bushes up front are shaped like bushels of grapes. Here like in many of my paintings there is a conflict between the grape and the cork. 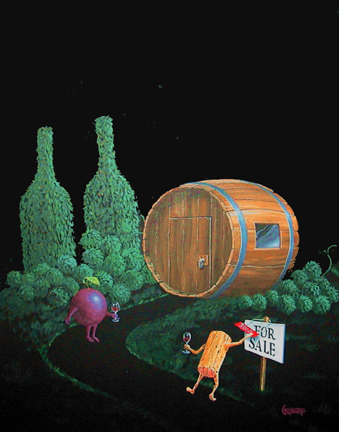 The grape just found a perfect home and the cork is putting a sold sign on it to take it away from the grape. The cork is taking away the grapes dream again.